Last week I spoke with Vonage's Michael Tempora, Senior VP Product & Program Management about the launch of Vonage World and Visual Voicemail. The big news was "Vonage World" with unlimited calling across the world to over 60 countries, which covers 2/3 of the world's population (4.5 billion) - all for $24.99/month. Sources have revealed that Vonage has submittd their app to Apple. Having a Vonage iPhone app combined with Vonage's World's global unlimited $24.99 plan could be a killer app that gives Vonage a shot in the arm. Imagine a SIP client on the iPhone that lets you call 60 countries - 2/3 of the world - as much as you want for just $24.99/month. Combine the large user base of iPhone users and the millions of Vonage users and what you could have is the most largely deployed WiFi VoIP phone on the planet! Forget about buying those standalone WiFi SIP or Skype phones which is another device you have to carry. But it gets better... Vonage's current SIP client called Vonage Companion has unique technology which enables it to "share" the same SIP credentials with your ATA device connected to your home cordless phone system. Thus, you can accept an incoming call on your PC using Vonage Companion or answer the call using your regular analog phone connected to your SIP-compliant ATA. I discussed this single identity to multiple SIP devices with Vonage last year. In a mid-2008 interview I had with Mary Grikas, Vonage's Executive Director of Device Development I asked, "What sort of technical challenges did you have having the same CallerID and the same phone number? Obviously, you are leveraging SIP and the ATA that sits at the home residence logs on with one set of SIP credentials and Vonage Companion logs on with different SIP credentials, but it's mapped on your back-end to the same phone number." Mary responded, "That's really a great question because we actually had to put almost a whole new infrastructure in place with a lot of new equipment. And we actually have proxies that are just dedicated to Companion to handle those calls. We do differentiate between the home TA DID credential and we do have flag for Companion. That way we know, as you said on the back-end it's all mapped and then we know where the call originates. We know if a call originates from Companion versus originating from the TA." Mary continued, "That was a lot of work for our call processing team. They had to do a lot of work configuring that system and all the redundancy and mapping. It was a pretty big effort, but it's something we were committed to doing because we had such an overwhelming request from our customers to implement a feature like that. So what does this mean for the iPhone & the Vonage app? Well, since their single SIP identity technology is done on the back-end, you will have a Vonage iPhone app that does the same thing as Vonage Companion. Thus, you will be able to receive calls to your home phone directly on your iPhone using VoIP or of course you can answer the call on your home phone.. No more remembering to setup your home phone to call forward to your cell phone when traveling! Further, your outbound calls can use your home phone number's CallerID and use your unlimited bucket of VoIP minutes. The real question will be if Apple allows the Vonage iPhone app to work over 3G. Don't hold your breath. They haven't allowed a single "official" VoIP app to work over 3G. Actually, I just remembered siphon for the iPhone allows you to turn on VoIP over 3G & Edge in the Settings screen in the app. How did that get past the Apple censors? Though, I only got siphone to work 1 time over 3G. Must be AT&T blocking port 5060 on their network. Update: I just tried siphon in California at ITEXPO and then back here in Connecticut and siphon worked both times over AT&T's 3G data network. Maybe was just a hiccup that one time I was trying it and siphon didn't work. I can now make & receive VoIP calls over the 3G data connection through my corporate PBX. I don't get it though -- why is Apple allowing a 100% standard SIP client to run on the iPhone while limiting other VoIP clients (such as Skype - or even other SIP clients such as fring or Nimbuzz) to just WiFi? I'll see if I can get Vonage to commit to a tentative date. So stay tuned for the launch of the Vonage iPhone app. 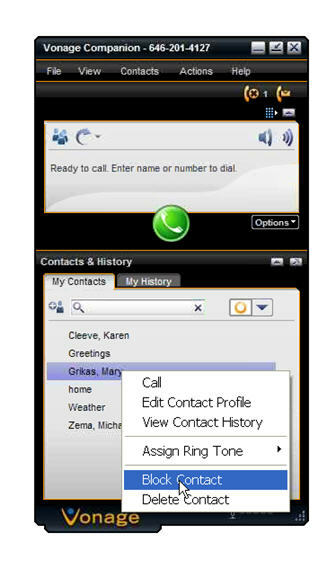 Finally somebody gets it....the functionality of Vonage Companion on a portable device is THE killer wireless voice app. The analytical community lost interest in Vonage well before the company released Companion, so it's almost a secret except to Vonage subscribers who use it. One number for the folks back home AND the road warrior--at the same time. A win-win-win for Vonage, Apple, and ATT----or for Vonage and whatever wireless carrier is smart enough to lever VG's subscriber base and technology. There is no way that Apple will make an exception for Vonage and allow VoIPo3G. If they do, it will open the door for a lot of complaints from the likes of Truphone, Fring, Skype and... Google. Without 3G, I don't really see the use as WiFi is nice and well, but just not suited to be always on and connected. It also is plagued by handoff issues which pretty much nails you down to one spot during the call. Also, I wonder how (and if) Apple's Push Notification service works with incoming calls. If it can't be used for that I don't see this going anywhere even with 3G support because without multitasking the client can't be used both both ways whenever it's not running then. Given that others have figured remote notifications out though (see Intel RWT) I guess being able to use 3G is the biggest issue. Vonage Companion on the iPhone, even just with WiFi, is the KILLER app for me. However, having used Vonage Companion extensively on my laptop while traveling, it's just not as clear and reliable as using the home router. "Visible Voicemail" app in the App Store does the following 2 items and works 100% over 3G or Edge or WiFi. So, Vonage Mobile has been launched. Doesn't integrate with your existing Vonage World account. FAIL. Back to the drawing board Vonage. What in the world? I just phoned Vonage, thinking that this new Vonage Mobile application would allow me to use my iPhone as a Vonage headset (around the house or perhaps even remotely if I had an internet connection). Nope. It ONLY does international phone calls and is totally separate and not integrated with the Vonage Home service at all. Well, that's worthless to me. Though it is not integrated with the existing service, it's still a great service to customers. You can make FREE calls to anywhere in the US and Canada using your iPhone number in WiFi coverage. I just begin to worry how Vonage can make money on this kind of usage. Vonage Mobile enables iPhone users to make FREE domestic calls even when you are out of country! This Vonage app is TOTALLY WORTHLESS. After months of waiting and anticipation, it was a total let-down to find out that this was only for international calling and separate from home service. This could have been a great app and value-add for Vonage customers. Instead they stuck it to us. I won't use this service, period. I'm also tempted to cancel my Vonage home service. If I can manage to get Google Voice and Gizmo5 setup on a VOIP adapter like SUNROCKET, I'll be ditching Vonage immediately.